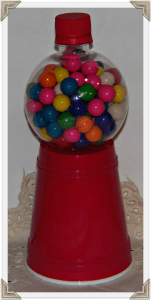 DIY Bubble Gum Machine (For Just a Few Dollars – Perfect for Valentines Parties)! 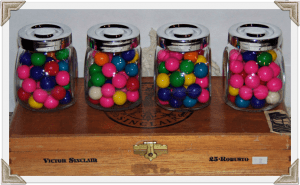 DIY Gumball Machines for Just a Few Dollars! Make a DIY Bubble Gum Machine for just a few dollars! These are great for birthday parties, Valentines Day gift, Easter baskets, baby showers or just because! My kids have been begging for a bubble gum machine, and they had a blast making these. I got most of my supplies at my local Dollar Store, but you can really use items you may even have on hand. I found the pre-made plastic bubble gum machine shown in the pictures above at the Dollar Store. While my kids loved them, they did not hold up real well as they tried to get gum out. So I decided to make these fun homemade versions, and they worked great. They are a nice alternative if you don’t have the pre-made versions at your Dollar Store too. You can use various materials for them. The key is to shop for shapes (and in various colors too if you’re throwing a theme party). Round plastic bottles (ex: Aqua Water, or coke bottles if you can find the round variety). You could also use the single serve Martinelli apple juice bottles, but they are glass). If your using them for a party, or want to give as a gift you can get 60 of these dissolvable labels These are great because they would stick well for a party, but you could remove them and reuse your jars afterwards too. To fill your machines, I found 5 oz bags of gumballs at the dollar store. You can also buy in bulk here on Amazon, or check the bulk bins at Winco too. This time of the year, you could also use the little candy hearts that are out instead of gum. 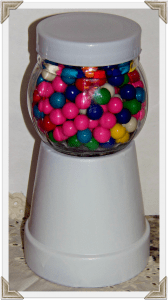 This DIY Bubble Gum Machine was made with a Terracotta pot, and a jar from the dollar store (total was $2 before gum, glue and paint). I found the jar with the white lid as is at the Dollar Store, and painted the terracotta pot white to match. Once everything was painted, I used a large hot glue gun to adhere the jar to the upside down painted pot. You could also use an apoxy glue or gorilla glue for a stronger hold. What I love about this one is that I can set it out on the coffee table, and it’s easy for folks to get in and out of to enjoy the gum. Because its larger, it makes a nice centerpiece. 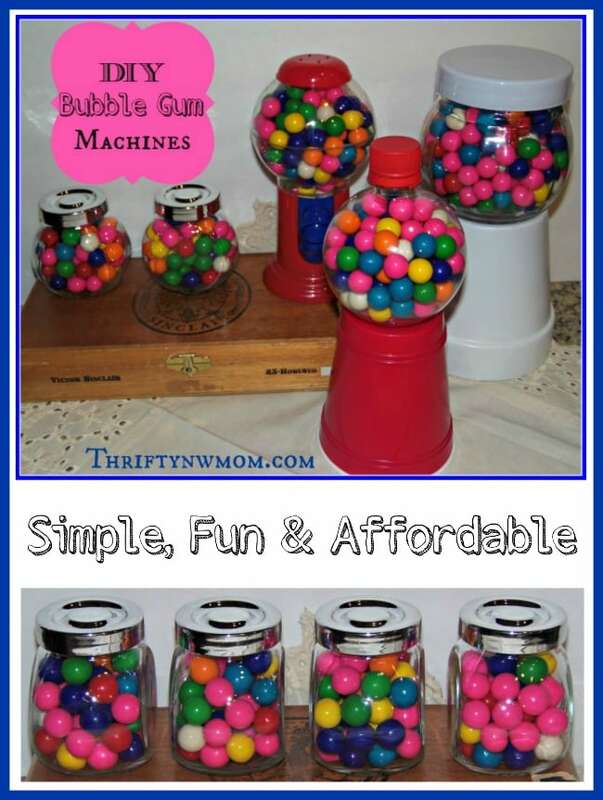 This is my favorite kid friendly homemade bubble gum machine. Its all plastic, so perfect for kids to help make or for kids parties. This one would also be fun to use to hand out as valentines at school parties (with the printable below). To make this version I used an aqua water bottle, and red plastic cup. I find these aqua bottles at my local grocery stores for $1 ea (see image below with supplies to see what it will look like on the shelves). They come in characters like Frozen, or Cars, etc. You can pour the flavored waters into a pitcher and let your family enjoy those, then wash out the round bottles and remove labels (I used a blow dryer to thoroughly dry out the inside). Once the bottle is clean, paint the top red, and let it dry. 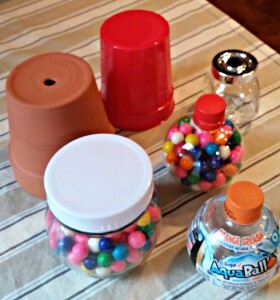 You can then use some hot glue to attach the round bottle to an upside down red cup. Fill with gum, and screw the lid back on and its ready for the kiddos to enjoy! I found this set of 4 jars for $3.49 at Ikea. That makes them just $.87 ea. You could get the labels mentioned below and put a kids name on each label for an easy party favor. The other thing I like about these ones is that they take less then a 5oz bag of gum to fill. These ones cost approximately $1.50 ea with gum inside of them. That price makes them a fun party favor for birthday parties, baby showers, weddings and more. If you want to use them for Valentines Day, you can use this FREE Printable Valentines Card “I Chews You” to hang over them! Popcorn Bar – Perfect for Many Occasions (Easy On the Budget Too)! Party Planning on a Budget – Check Out This Series!